Mercure Resort Sanur, Bali Holidays 2019/2020 - Book now. Sitting beside a gorgeous stretch of sandy beach, the Mecure Resort Sanur is a divine tropical escape for anyone looking to experience the stunning beauty of Bali. Ideal for a romantic break, dream wedding, or the family holiday of a lifetime, the complex, situated in the quiet resort of Sanur, is the perfect place to relax in complete peace and tranquillity. Guests can soak up the beautiful Balinese sun beside the Mecure Resort Sanur’s extravagant swimming pool, or lie back on the private beach and enjoy the blissful sound of the waves lapping the shore. If you’re looking to cool off out of the sun, the Mecure Resort Sanur’s rooms and suites provide guests with relaxing sanctuaries in which they can unwind, while the hotel’s restaurant is a superb place refuel and enjoy delicious steaks, healthy salads and fresh seafood. If you’re looking to explore Bali, there's a whole host of natural and cultural attractions to be discovered and activities to experience. From lush tropical rainforests to thrilling water sports, there’s plenty to see and do and the Mercure Resort hotel is the perfect base from which to start your adventure. 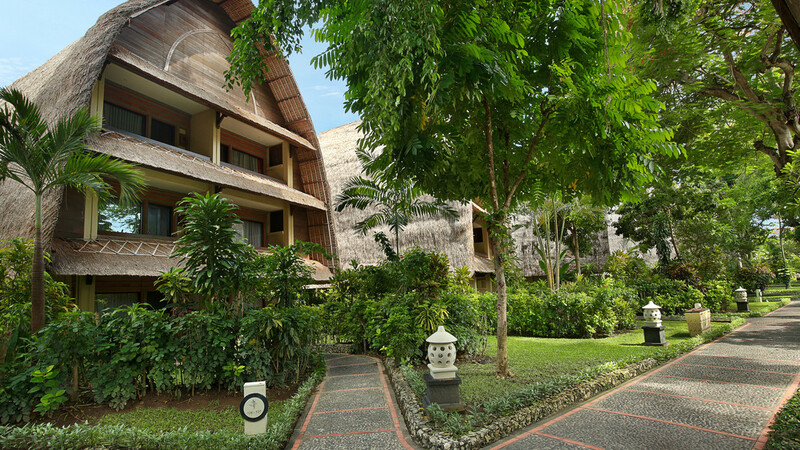 The Mercure Resort Sanur is located by the beach in Sanur. 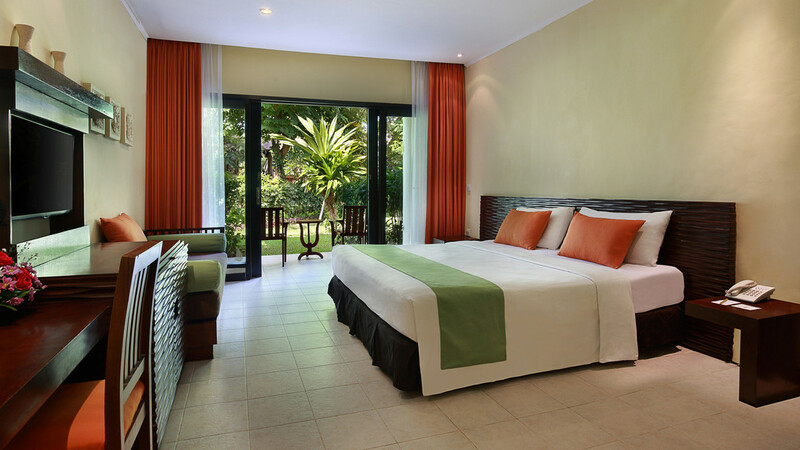 The complex is based in the beach resort of Sanur and is close to a number of shops, bars and restaurants. A wider selection of shops, bars and restaurants can be found approximately 3km away. Ngurah Rai International Airport is approximately 15km away from the Mercure Resort Sanur complex. 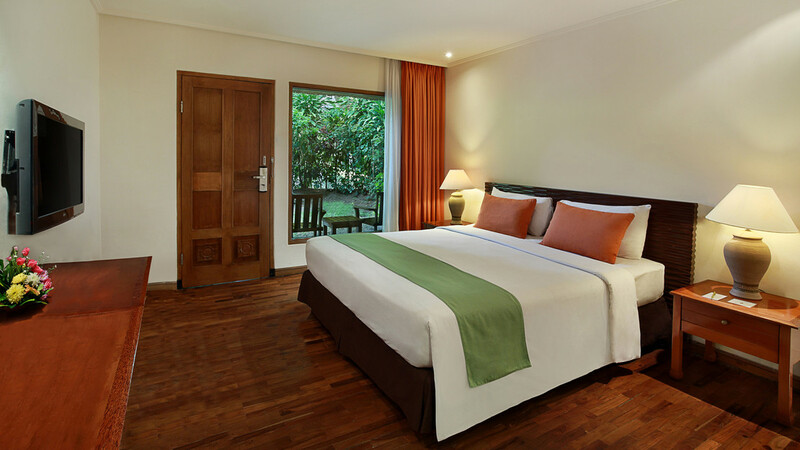 The Mecure Resort Sanur’s Family Suites provide guests with a welcoming retreat where they can relax in delightful surroundings. Those with bunk beds feature two bedrooms and a spacious living room, while the suites which include sofa beds are on two storeys, with the master bedroom on the second floor. Guests staying in the suites with sofa beds also have direct access to the beach and private gardens. Family Suites can accommodate 2 adults and 2 children. Combining modern decor with traditional Balinese accents, the Deluxe rooms offer guests a comfortable space for guests to recharge their batteries out of the tropical sun. 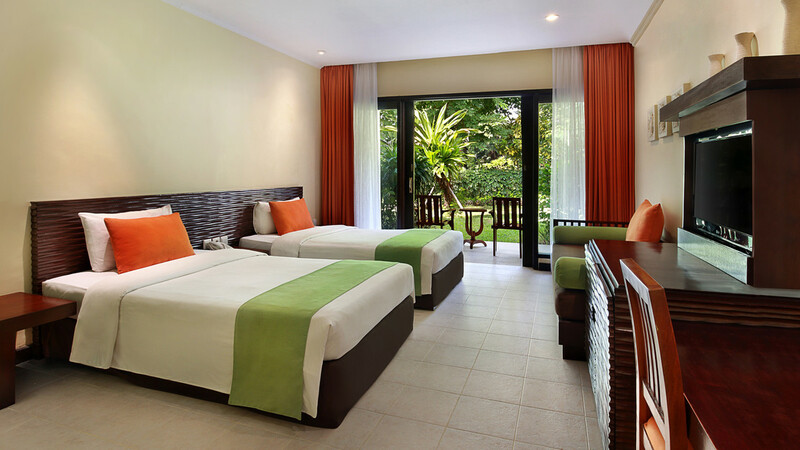 Deluxe rooms can accommodate 2 adults and 1 child and look out on the Mecure Resort Sanur’s tropical gardens. 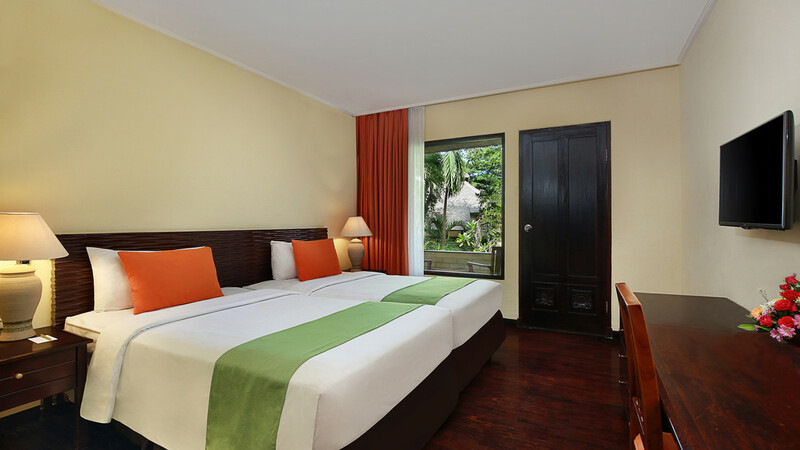 The light and bright Superior rooms provide guests with an elegant place to relax and unwind during their holiday in Bali. Looking out on lush tropical gardens, this type of accommodation has space for 2 adults and 1 child. Guests can enjoy delicious steaks, healthy salads and fresh seafood while taking in gorgeous beach views at the Mecure Resort Sanur’s Pandawa Restaurant. Breakfast is also available, with a buffet selection of hot and cold dishes on offer. The Pandawa Restaurant is open from 6.30am to 10pm, with regular evening entertainment provided. Sitting by the beach, The Breeze Bar is the perfect location for a snack while soaking up the sun and watching the world go by. Guest can also enjoy a refreshing cocktail or cooling beer in the shade of towering palm trees. The Breeze Bar is open from 10am to 12midnight. Serving a selection of tasty snacks, classic cocktails, fresh juices and chilled beers, the Sahadewa Bar is on hand to ensure guests are kept refreshed as they relax by the Mercure Resort Sanur’s Sahadewa pool. The Sahadewa bar is open from 10am to 11pm.